Website Pipeline, the market leader in ERP-integrated e-commerce, announced that the company has been named to Inc. Magazine's "Inc. 5000" list of the fastest-growing private companies in America. 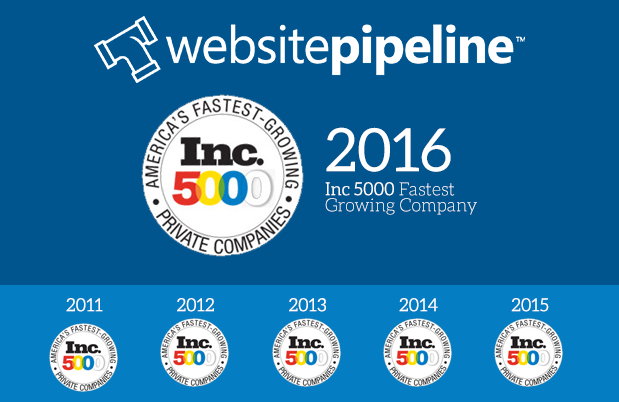 This is the sixth consecutive year that Website Pipeline has made the Inc. 5000 list. 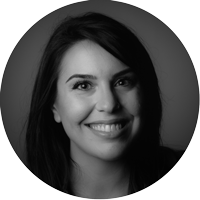 A three-year growth rate of 98% propelled Website Pipeline to the 3,359th spot. 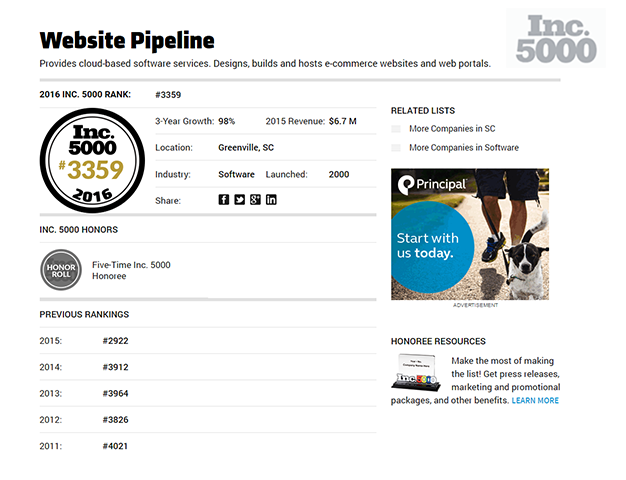 Website Pipeline ranks 40th on the Inc. 5000 list among South Carolina companies, and is the fourth fastest-growing software company in the state. Software is the ninth fastest-growing industry in this year's Inc. 5000. "Our tools help manufacturers and distributors get, keep, and grow their customer base while performing all of their customer-facing activities better, faster, and cheaper”, says CEO Brian Seidel. Website Pipeline has recently expanded into a 12,000 sq. foot office space near downtown Greenville, SC. This expansion will accommodate it’s growing staff of more than 70 full-time employees, 17 of which were hired in 2016 alone. Website Pipeline is a profitable, debt-free company that has funded its growth in classic bootstrap fashion - solely off its own revenue.